s our small film production company grew so too did the size of our projects - long gone were the days of DV projects that we could fit on an external drive. We were finding ourselves wrestling with HD and 10-bit uncompressed media and the old external drives could not reliably handle the data rates or the file sizes. What we needed was a RAID system—what we found were a lot of very expensive solutions that did not reflect the budgets we were working with. Then we came across the Sonnet solution [Fusion D500P] for a fraction of the price of the other options. The set up was simple and further expansion has proved to be a simple process. 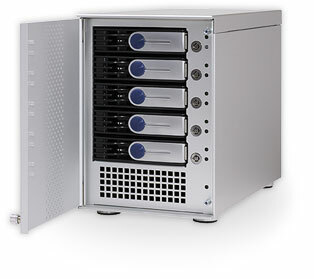 The drives are robust, fast and easy to use. The days of scrabbling around behind the computer plugging and unplugging externals is over and we will never look back. A great product that I would recommend to any small to medium sized film and video production company.